ABOUT US — Benchmark Bicycle Supply Co.
We are a full service bicycle shop with a focus on craftsmanship, companionship, and community education. Made for cyclists by cyclists. Ben Schowe, like any other kid, grew up riding bike through the neighborhood. He took it a step further when in high school he landed his first bicycle shop job in Virginia. He was hooked. Ben continued working at bike shops through college realizing that this was a career move for him. Through the years he has gained an awesome reputation for his customer service skills, technical knowledge, and fitting. Ben is a Specialized BG Certified Bicycle Fitter. He also has an awesome collection of 90's and early 2000's Shimano and Sram Technical Manuals. Benjamin Griswold grew up riding bikes everywhere and hitting some sweet downhills at dunes near his house when he was a kid. His first bicycle job was delivering newspapers in 4th and 5th grade on his 24" Huffy single speed. After working on personal and friends bikes, he got his first industry job as a mechanic/sales guy in college. Not long after starting in the bike industry, he started toying with the idea of building his own frame from scratch. Ben builds custom steel frames and loves lacing up a new set of wheels in his home shop. 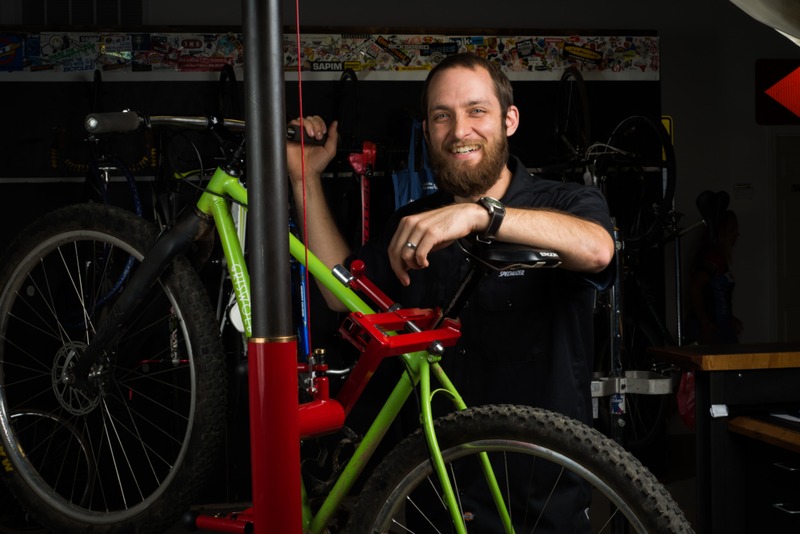 Ben's role at Benchmark is not limited to sharing his passion for riding, but as a master mechanic: if your bike has a problem Ben can figure it out and fix it (assuming it's fixable). He has completed suspension classes at SBCU and has a number of certifications from Shimano. He truly is a Master Mechanic. Tiana Schowe is the third partner in crime. This is her first bike industry job, but don't let that fool you. She is a dedicated endurance athlete, demonstrating her athleticism completing a Half Ironman as a very beginner cyclist. Tiana has finished (and continues to race) over 55 ultra-marathons ranging in distance from 32 to 100 miles (yes, she runs those distances all at one time). Once introduced to best practices for riding, she fell in love with the sport and is excited to be a part of the Benchmark team.